The Swiss wine industry is waking up to a new challenge: to raise the competitiveness of its wines, which has been eroded by the general strength of the country's currency during the first half of the 1990s and is becoming ever more evident as the liberalisation of the country's trade regime is taking hold. This report brings together material on the vital issues shaping the future of the Swiss wine market. After a brief look at the country's socio-economic situation, consumption patterns are reviewed. The market for reds and for whites is then examined. Much of the emphasis is laid on imports, which have hardly been looked at to date. A look at distribution channels shows how wines reach final consumers. A handy who's who of negociants-importers is supplied. Finally, Pierre Spahni provides a review of the most recent policy changes and looks ahead at those planned for up until 2001- and beyond. 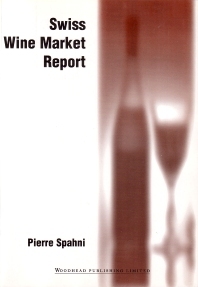 The report is aimed at a foreign readership primarily - not just exporters seeking to gain a better knowledge of this major market but also for economists, lawyers and civil servants interested in the wine sector and those dealing with Swiss trade issues in general. Political situation and economic outlook; Trends in wine consumption; The market for reds; The market for whites; Retail channels; Wholesalers and negociants; Marketing and trade policy changes.